You know I am all about those easy recipes. 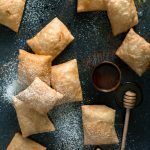 Desserts tend to be a little more complicated than regular meals, and I do have a few fancier dessert recipes to share in the next few days, but when it comes to easy recipes for dessert, these New Mexico style sopapillas with honey are amazeballs. The first time I tried a sopapilla was while I was in college in the tiny town of Socorro, New Mexico. A few friends I had made there took me to a little restaurant in town called Don Juan’s and it was there that I truly fell in love with Mexican food and these fluffy little pillows of dessert amazingness. Being a total newbie to the heat of green chile, having a sloppy, honey-drizzled sopapilla was like heaven to my burning tongue. 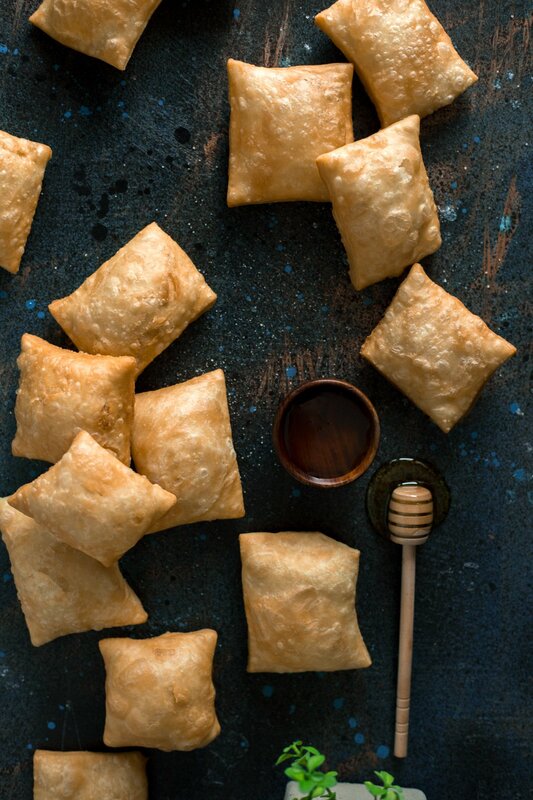 Maybe that’s the whole reason sopapillas were created?! Ha, I couldn’t say, they’ve been around for a very long time. 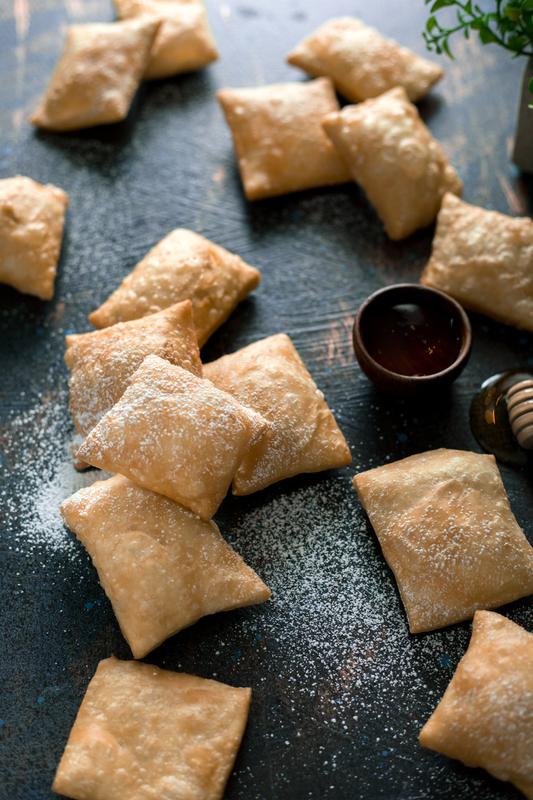 You can find sopapillas in many places these days, but different regions have different interpretations and ways to make this easy recipe. Here in Minnesota, you’re more likely to find them fried crisp and flat, and topped with ice cream. I mean, it’s still good, but when you’re used to these fluffy pillows, there is just no comparison. It only takes a few simple ingredients to whip these up, that’s why it’s among my easy recipes. No yeast. And they roll out with ease, which I recommend rolling them out to a thickness similar to a flour tortilla. Not too thin, not too thick. If you get them too thin, they won’t puff up at all, which would be the saddest thing ever. Seriously. I had a few failures when I wasn’t paying attention and I pouted. 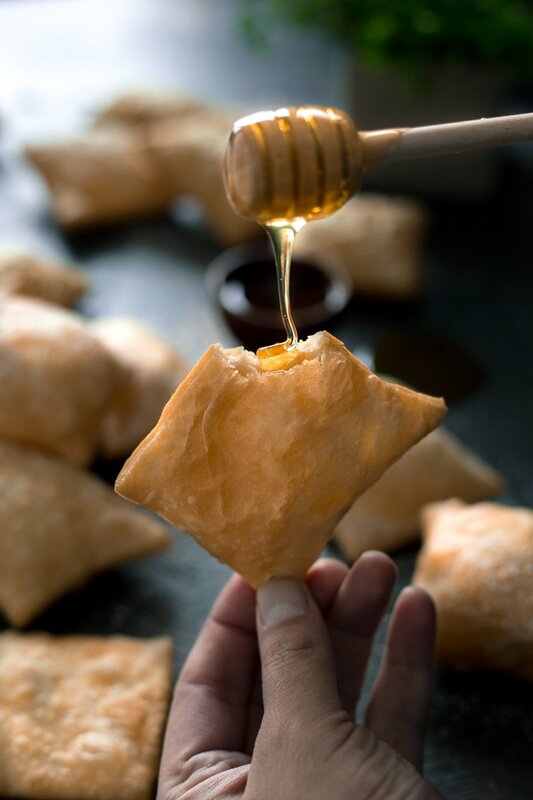 My favorite thing to do with sopapillas is bite off the corner and drizzle honey inside while they are still warm. OMG so good. I could eat a million of these things. So if you’re in need of some easy recipes for dessert, you should definitely start right here. You won’t regret it. In a large bowl, stir together flour, baking powder, salt and shortening. Slowly stir in water and mix until dough is smooth. Cover and let stand for 20 minutes. Heat oil in a deep frying pan to 375 degrees. Roll out dough on a floured surface until 1/8-1/4 inch thick. 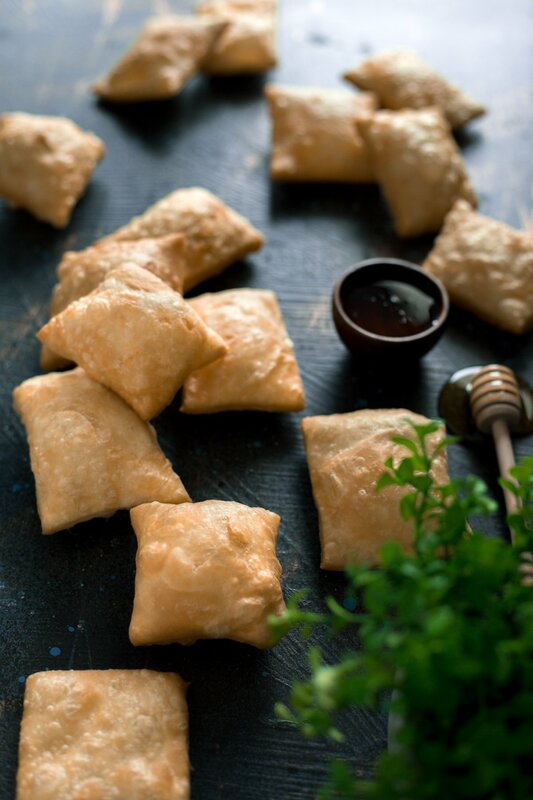 Cut into 3 inch squares, then fry in batches until puffy and golden brown on both sides, around 4 minutes per batch. Drain on paper towels and serve warm with honey. Nutritional info will be skewed based on the need for a lot of oil for frying. 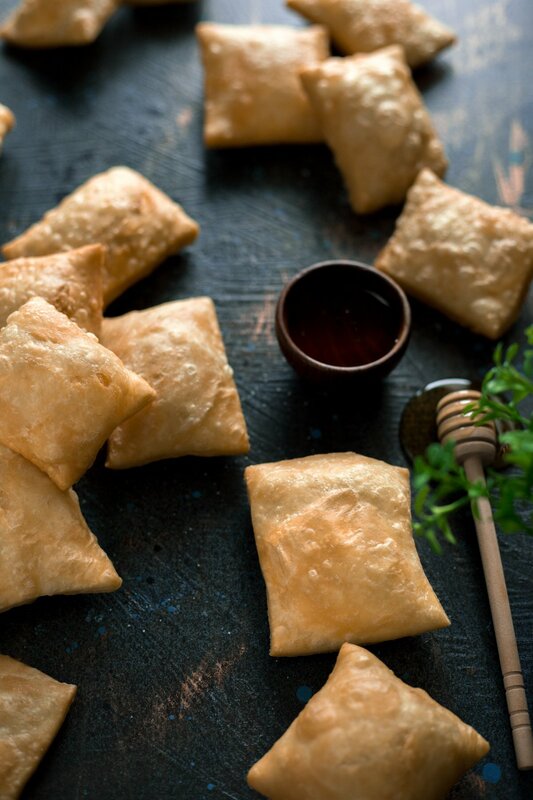 If cooked at the proper temperature, assume a retention of about 1 tablespoon of oil per sopapilla. Hi, Karly!!! How wonderful is to find out that you also live in San Antonio! Could not resist your sopapillas. 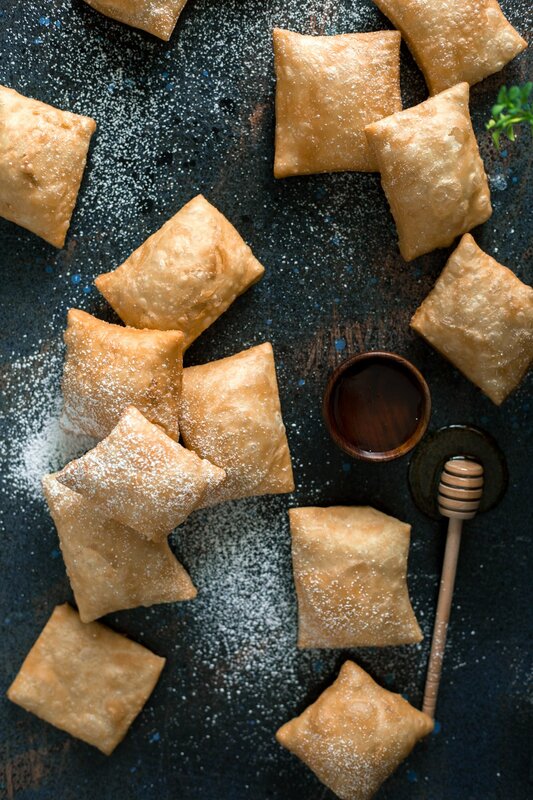 I have tried cheesecake sopapillas but with your recipe in hand I will be delighted by these New Mexico style ones.